Polite society has a way of telling artists where to “draw the line” or not to “cross the line” in the name of political correctness, family values or so-called community standards. As if artists in all fields didn’t have enough to worry about in today’s economy. Whether they mark, speak, walk, write or toe that proverbial line, all of them wonder, “Will it play in Peoria?” Yet while artists balance on that fine line between censorship and consumerism, all of them hope you will get in line and come see their work. No matter how an artist answers to “What’s My Line?” fashion designers, architects, graphic artists, dancers, actors, musicians, writers and visual artists will tell you it’s all about the show. Everything else will take care of itself. At the risk of stretching the point even further, an exhibit at the RNG Gallery covers this territory, both in nature and society, in Line by Line by Line . This is a two-person show continuing through Feb. 6, featuring the sculptural “cuttings,” video and drawing of Susan Knight and the photography of gallery owner Rob Gilmer. Though the “line” referenced in this show is more conceptual, it clearly demonstrates the risk each artist takes in hoping that viewers will buy their line, both aesthetically and commercially. In the past, Gilmer has exhibited mostly landscape and portraiture, work that is both personal and easily accessible. In this show the imagery is more abstract, the point-of-view less emotional. On the other hand, Knight’s sculptural and monumental pieces have always been abstract and esoteric as they place even greater demands on a discerning audience. This exhibit is no exception as her work continues to be an object lesson in how the artist connects to her environment, especially water, air and light. Overall, Line by Line by Line is an impressive show and with one notable exception, well curated, lit and hung in RNG’s three gallery spaces. Mostly larger work, each of the 11 photos, drawings, and sculptural pieces enjoys its own wall, space or corner. This presentation is ideal, as each one is unframed, therefore allowing their “lines” to be more expansive. Knight even includes a video, a waterscape that ripples on and off the screen. Movement, then, is a motif in this two-person show as each artist vividly demonstrates that even in a still photo or drawing and a stationary sculpture, a work of art is always in motion. Horizontal lines broaden our field of vision and imagination just as vertical ones lift or lower our spirit. Diagonal lines alter our perspective and curvaceous ones raise levels of anticipation, passion and energy. For their inspiration, Knight and Gilmer draw upon natural and man-made environments. They say in their artist statement they were struck by the similarity of their birthdays, hers 1-1-11, his 1-11-11 and the repetition of vertical and angular lines. Ironically, unlike these equations, there are, as in reality, very few purely horizontal or vertical lines in this exhibit. Rather than reflect their birthdates, the dominant diagonal, angular and contour lines demonstrate instead their personalities and talent. Which, despite sharing a similar astrological sign, is quite different. Knight shapes and crafts her lines, which emulate what she experiences in nature. Yet her work is more cerebral and detached as she connects with nature’s own aesthetic rather than its representation. She focuses on the essence of her environment in microcosm and then recreates it on a grander, more graceful scale. There is a sublime beauty to the best of her work, which transcends any specific lake, surface or shore. Her lines are at once dense and delicate. They are formally structured and etched, yet impermanent enough to risk unraveling or blowing away in the next puff of wind. Gilmer, on the other hand, is more sensual, immediate and spontaneous in POV and style. His lens discovers and then documents his connection to nature and society, shooting and composing full frame with little or no manipulation other than natural camera movement. His lines are those revealed to him in his viewfinder; but this time, though his imagery is still representational, like Knight he chooses to isolate on a detail of line, movement or mood rather than location. In spite of their differences works often speak to another in unexpected ways. In the first room Knight’s moody video loop, “Magic Observations,” parallels Gilmer’s photo “Siding” literally and conceptually. The former is liquid poetry in motion as wave after strobing wave ripples to shore as it mimics the horizontal house siding of the latter, whose lines and shadows seem to undulate by that same unseen force in art, the imagination. Conversely, in that same room two additional pieces, “Roller Girls,” Gilmer’s colorful, rollicking mayhem on wheels and Knight’s large, horizontal “Trail,” a black and white and mostly gray drawing, are polar opposites. Both are uniquely ephemeral works. In the first Gilmer blurs color, line and motion in a trail of light and palette of red not unlike the ballet paintings of Terry Rosenberg. And Knight buries and blends the figurative deep inside layers of dusty cross-hatched and intersecting lines on her trail bed. In the back room two large works continue this conversation of line and motion. On the east wall we have literally, “Crosswalk,” Gilmer’s black and white, birds’-eye view of a busy intersection. To its right is Knight’s sprawling sculptural filigree of cut paper, “Fusion.” Though both are abstract, Gilmer’s is bold, busy and graphic; its geometric street hatchings appear to fall into the viewer’s lap. Knight’s piece is organic, an amoeba-like piece of flotsam and jetsam just washed in on the shore. Look again, and intended or not, the lines in each workflow, meet and crossover in the center like an unfinished figure eight. 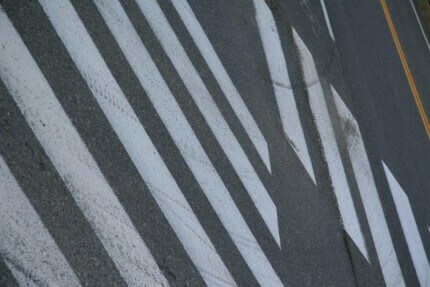 Interestingly, and in character, Knight establishes it by design and structure; Gilmer does so more by chance, as one part of his equation is a line of tire tracks caught by his camera that intersect with crosswalk markings. The only distraction in this gallery is the placement of “Fusion” on the south wall jammed against a doorway to its right, thus cramping its style and our view. It’s especially disconcerting since the large west wall is left bare. If the cut paper were flexible enough one can imagine it flowing across this space and down across its ledge. Or perhaps “Fusion” could have hung on the east wall and “Crosswalk” on the west. After all, if opposites do attract, let them square off along a line of fire and communication with the viewer in the middle of the conversation. Line by Line by Line continues through Feb. 6, at RNG Gallery, 1915 Leavenworth St. (Use Dixie Quicks entrance.) Call 346.3549 for details.